I just started drawing without any idea about, what it was going to be, so I was surprised when the figure began to take shape. It was clear to me that this was an attempt to grasp the pain I am feeling most of the time. My pain always starts in the back of my head and spreads out through my limbs. That day the pain was extremely strong in my neck, down my back and down through my legs, and somehow the pain spilled over into the drawing. Back in the fall of 2014 I had a major breakdown. 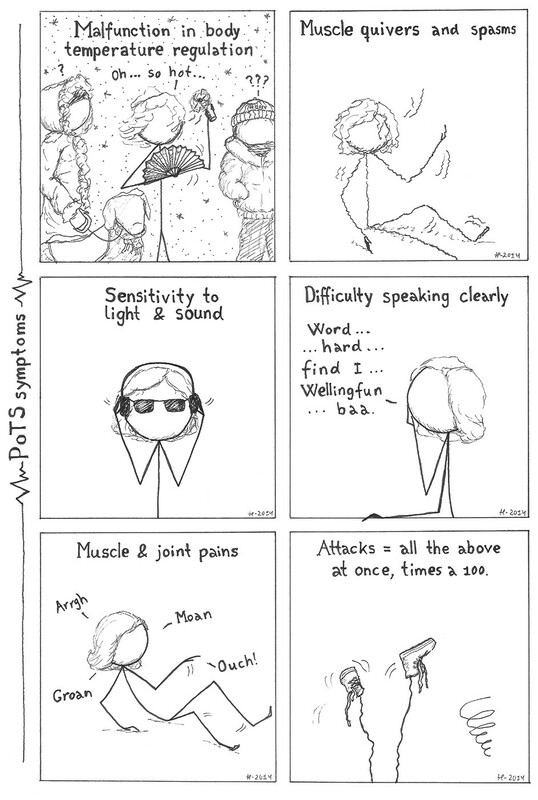 I have lived with POTS for many years, but in the last 2-3 years my symptoms have become more severe. Then I reached a point, where I felt that I was losing the daily battle to keep a life worth living. I was exhausted both physically and mentally, and in the end I contemplated doing the most drastic thing, which a person can do, to escape my situation. But luckily some part of me fought against the temptation, and in the end I sought help. Since then I have been trying to come to terms with living like this. It has not been easy. I went on sick leave. I got professional help. And I used hours just staring at the wall trying to figure out what to do with my feelings about my life. I had been ignoring my feelings for quite some time because I felt like I should be OK with my medical condition since I have lived with it for so long. It was like I had a deep-rooted feeling that it was unacceptable to struggle with the whole concept of having a chronic illness for more than a few years after being diagnosed. Well, I was not used to it, no matter how much I wanted to be. I had focused so much on getting my life to work, on keeping my job, on keeping my husband and on maintaining a social life that I had not been focusing on keeping my sanity. And that fall I was paying the price for the neglect. It was a very scary time for me, and I can only imagine how scary it must have been for the people close to me. I hit the bottom and then had to climb even though it made my fingers bleed and my body ache. I knew that it was important that I did not let my body fall apart as well. I, therefore, kept doing all the things I normally do to keep it as healthy as possible: yoga, eating right, breathing right, meditating, keeping hydrated, etc. In some ways, I made that my “job” in the period where I stayed at home. I tried to establish a feeling of joy in all these activities. In the beginning, this was not easy since I felt like it was an almost useless effort. I mean, why use time and energy on preserving a sick body, when I wanted so much to get away from it, that I thought death was a solution. But I have always been stubborn, so I kept doing it and kept seeking a feeling of pleasure in the tasks. At the same time, I started working with my mind. I went to a psychologist, who helped me a lot. But the main change came, when I began working actively with my thoughts by studying and meditating. I found a lot of different books about various aspects of developing a healthy mind: books about Zen, meditation techniques, changing unhealthy thought patterns, etc. I did however NOT read anything directly about sickness and chronic disorders. My choice of inspiration was not a conscious one at the time, but I noticed the tendency afterward. In some ways I think it was a smart move to focus on finding a positive attitude instead of focusing on the sickness. My studies gave me a lot of new techniques, thoughts and ideas on how to change my mind in a way that made it healthier. The studies then gave me the inspiration to contemplate ways to cope with POTS. Gradually I started to feel a calming sensation spread in my body and mind. 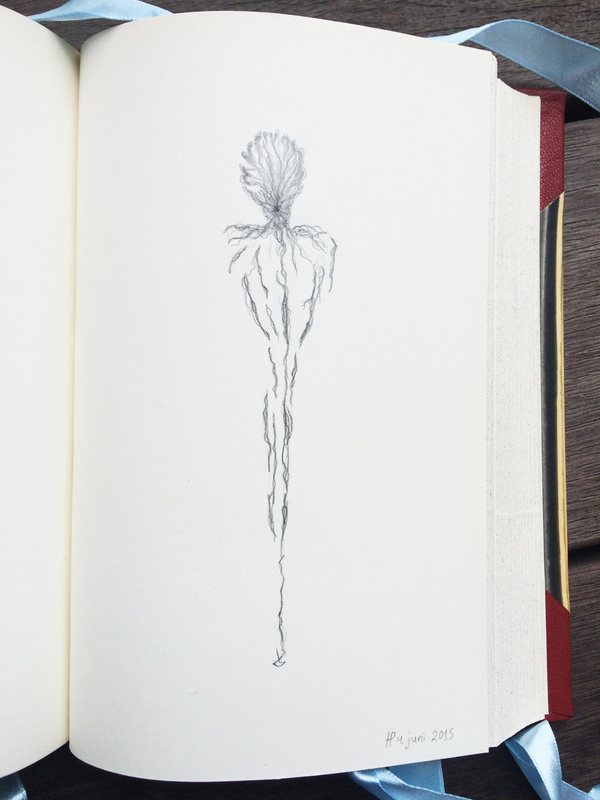 I felt connected to my body in a new and intense way. I started feeling more that “I am my body” instead of “I have a body”. And since my body has POTS, the sickness is also me, and, therefore, “I am my POTS”. But not in a way, where I define myself only in terms of POTS, but more that POTS is a part of me in the same manner as my lungs are. I do not define myself constantly by my lungs, but I have no doubt about them being a part of the entity that is I. In spring, I was back at work on part time and gradually increased the work hours until I was back on full time. Today I feel so much better, and last fall seems like an unreal nightmare that happened to someone else. But I know it happened to me, and I know I have to take care not to end back there again. Although my mental health has improved, my physical health has not improved, for no amount of rest or healthy routines can make my POTS symptoms disappear or just decrease. Every day is still a battle for living a normal life within POTS’s constrains. And now I also fight to keep a healthy mind. Although I, therefore, have an increased “workload” for my everyday life, I do feel stronger and happier today than I have felt during my whole life with the chronic condition. In the same manner as I keep my body strong by doing yoga every day, I now seek to keep my mind strong by meditating, studying inspirational books and contemplating my life for a short time every day. Of course there are days when I don’t have as much energy for all this work with my body and mind (which I do along with a full-time job), so I do take breaks. But after just a day of relaxation I start feeling an urge for my routines because I can feel how good they are for me. At some point, I hope that many of them become second nature, so I don’t have to be quite so focused. Now I just keep my fingers crossed that I do not fall back into that dark and terrible pit of despair. And I keep reminding myself that learning to cope with a chronic illness is not a one-time thing, it is a continuous effort that needs attention and hard work. See that animated gif to the right? Well, that is basically me right now. I had a major breakdown in the end of November 2014, where I started getting really bad thoughts and I couldn’t handle anything any more. I was so fed up with having to pull myself together to live “a normal life” while feeling like crap because of POTS, which has become worse over the last couple of years. I started getting help and for a month I kept on pulling myself to work everyday, but I just wasn’t getting any better. The stress of the situation made my POTS even worse, and that made me even more stressed. You get the picture, right. The circle of madness. So at the end of December I went on sick leave. For the past month I have tried to get back up from that black pit, I had fallen into. And the best way to explain what that feels like is “bootstrapping”. That is to pull myself up by the means of my own bootstraps – Well, I don’t actually have bootstraps in my shoes, so in my mental image I use my shoelaces instead ;). Or to rephrase it without any footwear related lingo, it is to do something without getting help from the outside world. Just think about what an immense herculean task it would be to actually physically pull yourself off the ground just by pulling at you own bootstraps. Really try to feel what it would take. The point is, it is an incredible victory if you can do it. Since I have a feeling of “pulling myself together” every day just to get out of bed, that phrase has sort of lost it’s meaning. And for a month ago it felt like there was nothing more to gather together – I was all out of self. And at the same time the phrase has lost it’s meaning, because of the way it is used. Pulling yourself together is said to someone who just needs to stay awake 5 more seconds or has to not eat that creamy cake while on diet. So it sort of ends up sounding like it is an easy thing to do, that “you just have to pull yourself together”. Honestly, I have been frightfully close to doing something violent, when other people say that to me, because believe me there is nothing “just” about what I have to do every day to simply function. And when in the black pit, you can multiply that with a thousand. A while back I wrote a post about hope (Here’s to Hoping). I had just started to take Gutron in small quantities, and the results seemed promising … hence, the hoping. So I thought that now it was about time to evaluate. For 14 days the effects of just taking 1/4 pill (1.25 mg) three times a day was amazing. I felt like my old healthy self for at bit, which was amazing. Then from one day to the next the effects wore off, and all I was left with was side-effect. So I increased the dose to 1/2 pill 3 times a day. Increasing the dose went well, and some of the benefits didreturned; although it was far from the exiting feeling the first few weeks. I tried taking a larger dose, but that still made me very sick, so it was clear that I had to move forward gradually. After three weeks on that dose the effect started to disappear once again (and mind you, when the effect disappears it is in no way a gradual process, from one day to the next they just stop working, resulting in a major physical crash). Once again I increased the dose, now to 3/4 pill three times a day. This time I was very sick for two days with only side-effects before the medication’s benefits finally kicked in. But thankfully they did. I know that the first 14 days of bliss will not return. By now I know my body well enough to know that it can act surprisingly well if it is challenged but that it never lasts very long. But of course I still hope … who wouldn’t. For a short time, it was like getting my old life back from before I got sick. And no matter how much I tell myself that the return of the sickness fits a pattern I already know, it will still be a disappointment. But I have to face it. Gutron does not cure me (not that I thought it would). And the side-effects are numeral: stomach ache, the feeling of burning skin, limbs falling to sleep again and again (they even sleep when I run!!! Feels so weird), distortion of my sense of taste and smell, sleepiness … just to name the most irritating. So should I stop taking them? Well, the mind is a funny thing. If I should just evaluate the experience from how I feel, I would say ‘dang no, this is bad.’ But lucky for me, I have learned not to trust my intuition. Yes, the side-effects are numeral and the effect is not as big as I hoped. But looking back at the experience with only my own feelings as guide it gets too colored by my disappointment that it did not cure me. And the reason I can say this is that I keep a symptoms journal. Or in my case I use Symple’s app to record my symptoms every day, and it brilliantly provides nifty graphs for my symptoms to give a clearer picture of how I feel. I know I cannot estimate how I feel, because I feel like crap all the time. So when I need to know, I look at the Symple stats. Trust the numbers not the feelings! And in this case they show clearly that Gutron decrease almost all my symptoms. They do not disappear, but overall they are all half as bad. I have headaches half the time as before. I have attacks half the time as before. Etc. Etc. Reading what I just wrote I realize that what I am trying to tell myself is: sometimes I get too caught up in finding the thing that cures me completely that I don’t realize the benefit in what I got. And that is not something I should beat myself up about because that is just how it is being really sick and desperate. But thankfully I have an aid like Symple (I must emphasize that this is not a commercial for that specific product, there are many similar apps out there, that works just as fine), which makes it easier to remove the sickness’ mist from my eyes and make me see my situation clearly. Yes, the situation is not good … yet. But Gutron makes my situation better. So maybe I feel like my skin is on fire and my stomach is about to implode, but I am better overall! I have more energy! Which means I have more time! But I lost track of that in my own feelings of disappointment. I’m used to feeling like a living corpse all the time, so what if I need to feel like a living corpse on fire just to get some more out of the precious time I got? And who knows, maybe the doctors can help me battle the side-effects. Several days ahead I feel the butterflies in my stomach. A mixed bag of butterflies with fear for the unknown and excitement for the possibilities of a change in this annoying stalemate. It’s been years since the last time, and I feel like I’m fumbling through the process again like a newbie. I try to prepare, considering for hours what I can say to seem like someone in control, so I won’t be taken for a ‘confused’ individual again. Under the shower, I test drive some of the sentences, but they all sounds so pathetic. I examine every inch of my body … just in case. Shave my legs and armpits. Use creams and oils and perfume. I look at myself in the mirror. Consider the amount of make-up. A delicate balance. Not too much and not too little. I end up talking to myself in the mirror although I always thought that was lame (but once you have seen it in a movie I guess your subconsciousness start believing in the effect). Then I remove all the make-up once again and jump under the hot shower. The butterflies are talking. I look at myself in the mirror. Naked. First from the front. Then the back. And then around again. Want to be sure that I haven’t forgotten some embarrassing part of this already awkward body. Then I consider the clothes, another hurdle. I’ve bought new underwear just for this occasion as if it would bring me luck. And also to be certain that there will be no holes in it. But am I certain? So I take it all off and examine it. Okay, good to go … got to go. And I dress in nicer clothes than usual … different clothes than normal. Deep down I know that it means I reflect another personality than my own, but I ignore it, because today I really feel the need to be someone different. Someone who is stronger. Someone who is wiser. Someone better. Before I go I take on extra perfume. On the way, the butterflies get worse. On the way, I wonder if I should turn back instead … will it be worth it. Will it end in disappointment again? The drive feels like an eternity, and I feel all wrong in these clothes. I yell at myself inside myself to keep calm and create a smile on my lips … I know it will help if I arrive with a calm smile. For many years two feelings primarily dominated my life. One was anger, oozing out from the pain of being sick and primarily directed toward the cause of it – my own body. The other was fear of losing the good things in my life because of POTS and the way it made me a less attractive individual. The biggest concern being that my boyfriend would either leave me or begin to hate me, because I held him back and stood in the way for him to lead the life that he wished for. The fear is still present today although it has diminished to a more rational level – and after all love is always mixed with an amount of fear for loss, so I don’t think it will ever go away entirely. But how I handled dealing with the fear is a subject for another day, because what I want to write about today is handling the anger. The two feelings were however connected in the sense that I one day realized something odd. I hated my body and wished I could leave it, but at the same time I feared that my boyfriend would hate and leave me. That became quite a wake up call for me. I realized that I had to find a better way of living with my sick body, because how could I hope that someone would love me in spite of my sickness, if I could not love my own body in spite of the exact same thing? I therefore decided that I had to deal with the feelings of anger, hate, disgust and disdain toward my own body. But how? Feelings can after all be so very hard to control. The process turned out to be rather organic. I quickly found that making a ‘plan’ and following it did not work. The main reason for this was, that I had no real communication with my body. At some point in time the anger had made me stop listening to my body unless I absolutely had to. So I was actually only really in contact with it, when the sickness forced me to be. The first point therefore became to learn to listen to my body and because it became a question of learning to communicate it had to be a more organic process due to the fact that I (I as in my mind) was not the only participant. So the first step was to learn to listen to my body. Meditation helped a lot with this issue, giving me the tools and the time to fine-tune my internal ears. I also tried to become better at remembering to listen to my body during the day, which at first meant setting reminders during the day until it had become a habit (in stressful times I still set reminders, because I know that although these are the times when it is most crucial to be in contact with the rest of myself it is also the times when it is hardest to remember). The next step was to change the way I looked and felt about my body and thereby learning to love it. So I began to focus once in a while on the positive aspects of my body. Like that it was rather pretty, that the proportions between the parts are okay, that because I have to eat well and exercise on a regular basis it is quite healthy and strong, and that it actually functions pretty well apart from POTS. The last thought was the hardest to get connected to since it often doesn’t feel like it is anything apart from the sickness, but it turned out to be the most important because after internalizing this idea I started to feel like the sickness filled less in my body as if it became isolated to the parts that did not work … and this in turn made me feel that the illness overall took up less space than before. Then I decided to change the way I reacted towards my body, when it failed ­– or more precisely when the illness made it fail. Normally the malfunctions ignited a great rage in me, which often made me act rather cruel towards it. In the worst times I actually could be so angry that I found myself hitting my own limbs while cursing them. Or I would do ‘angry yoga’ (stretching out after an attack will diminish the aftereffects, so I try always to do some yoga afterwards) pushing my body ridiculously hard to sort of punish it for being disobedient. Looking back I realize how negative and destructive these reaction were, but at the time they had seemed so natural because I was being ruled entirely by my emotions. Now I tried to prevent these tendencies and do something constructive instead. That was very hard, since it meant doing something active at the point where I had the least amount of energy and control. It took me over a year to really change it, and I still fall back to the destructive reactions once in a while (especially in situations where I feel that my sickness’ has consequences for my loved once too, which means it is when I feel the fear of loss at the same time). The thing that really helped me with this process was to actually talk to my body both while the malfunctions occurred and after. So I started to speak to my body, as I would wish that others would talk to me while it happens. I tell it things like: “It’s okay”, “I still love you”, “Relax, it will be over soon”, “This is just a minor thing and you are still precious”, “This is not your fault” etc. And these soothing words really help. When I’m alone I even say them out loud and they become a comfort for both my body and my mind. Then I do yoga while focusing on doing it as a healing and loving gesture towards my body. And finally if the energy is there I massage my limbs to make the tensions go away. Changing these things have made me respect and love my body in such a way that I now feel like we are two forces handling the malfunctioning situations together. When my body fails me, my mind takes over and pushes toward healing. And when my mind fails me, my body’s strength reminds me that I can still be strong. So I have basically become friends with my body and this oddly makes me feel less alone in my sickness, like I’m two instead of one battling the illness. I have been told that some eastern cultures does not have the concept of body and mind as two separate entities, which I have always found both fascinating and inspiring. But I must admit that in this particular case I’m rather glad that I feel like they are two entities, since in the face of hardship two is stronger than one. The content on this page are my own personal experiences with living with POTS. I am not a doctor or in any way a health professional, so contact your doctor before following any of my advice. For many people with a chronic illness like POTS, work is a very sore point. The only constant in one’s life is that nothing is constant. Even after living with the sickness through many years, I don’t feel like it has become easier to predict how my days will unfold. The wires do not just get crossed so that regular irregularities happens. No, the wires are flip-flopping all over the place, so you have no idea which ones are getting crossed next and which kind of meltdown is lurking around the next bend in time. So my body is unpredictable and thereby I’m unpredictable … and hence a normal work-life can seem impossible. I have until now been extremely lucky. Since 2006 my life became increasingly difficult because of POTS, but through a million miracles I actually managed to get my degree in comparative literature and was later blessed with an exceptional and flexible job. I work at a place where there is room for someone like me and — just as important — a boss and coworkers that are understanding and patient. I have flexible hours which makes it possible to work full time, because I can work when I can and rest when I can’t. I can also work from home, which makes it possible to even work while being sick (and therefore I have by now mastered the skill of working in bed). But although I have been blessed in such a way, believe me, it is not easy. Literally every day is a new battle, since the pains are always there and attacks of all sort fly by constantly. But I am learning how to live with them and how to get myself into “work mode”, so I can keep up with the workload. In some periods, it all goes wrong, and days disappear in the mist of sickness – yes, I do have many sick days, but on the other side I compensate by working evenings and weekends when it’s needed. In other words I fight to keep up, so I can keep my job. Don’t get me wrong, I’m not a workaholic who ignores reality. Part of what I fight for every day is finding the balance between work and private life, and between work and illness. I try to listen to my body everyday, so I hopefully do not overstrain it. But I feel an importance in work because of the sickness. The thing that mainly makes me feel that way is, that I have tried to be on sick leave. That period was one of the absolute worst times in my life. It was before I was diagnosed, so I was on sick leave without (so to speak) a good reason, which of course did not help on the situation. But at that time I became more and more one with my sickness. When talking to others, I had nothing to tell, because all I did was being sick. And I’m a person with a million hobbies and interests, so it is not because I can’t find something exciting outside of work, but when the pain becomes the primary part of you, you loose the ability to motivate yourself. “Yes,” you say to yourself “I could read a book, paint a picture, draw a comic or just go for a walk, but I don’t feel like it today.” So you end up postponing everything to a day that never comes. Work on the other hand is different, because someone counts on you to do it. So you push yourself to actually do something on the bad days, and it almost always turns out that those days are not quite as bad as those used sulking in sickness. You get distracted from your situation and that makes it easier to live with it. Or at least that is how I feel. Avoid stress! It will make you very ill, so you have to take it serious. Be honest about your needs and talk to your workplace about them, you never know what might be possible. 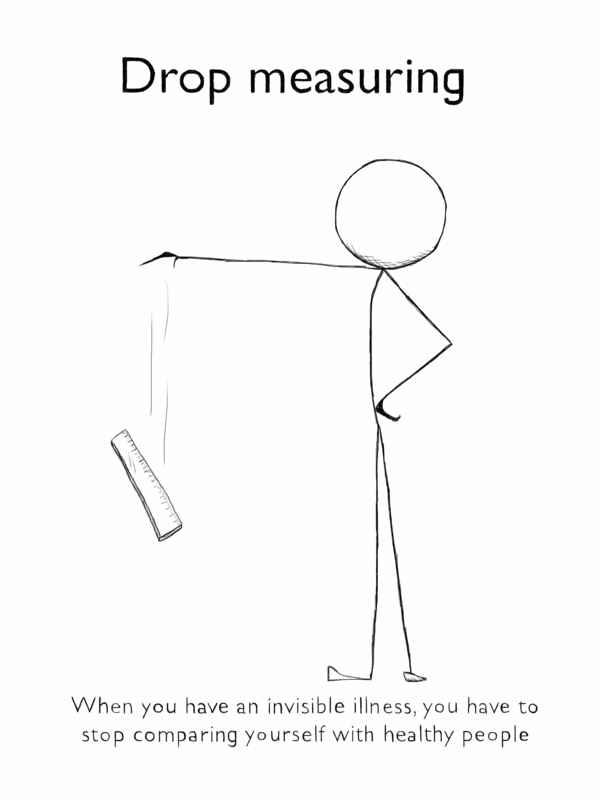 Never trust you mind – you never know, how you will feel in the near future, so plan ahead, write things down, and create workflows that are flexible and filled with safety nets. Focus on creating a routine that ensure you also take care of yourself and your body. Listen to your body before you even head out for work and learn to spot the small signs that trouble are coming, maybe you need to take it slow that day or work from home, to ensure that it won’t get really bad later. Remember to drink lots of water. Try to take breaks frequently, maybe you’ll end up working an hour later because of it, but it might ensure that you won’t feel really bad, when the day is over. It’s better to work more fragmented than working 8 hours straight and then being sick the next day. Economize your energy. Avoid planning things in the evening on hard work days. And in the same vain, avoid having too much stressful work and meetings, if you have plans in the evening. Try to find a pattern for which time on the day there is a higher risk of becoming ill, and make sure to avoid meetings and stress at those times. Tell you colleagues, so they know what to do if you become ill.
Focus on the good parts of the day instead of how your POTS was acting that day. Plan so you can rest after work if needed (which it almost always will be). Remember your body. Try to find some exercises you can do at work that keeps you blood flow stable. For me, it’s shoulder, neck, feet and leg exercises, but find the ones that fit your needs best and do them minimum once a day at work. I don’t want to sugarcoat this. Working while having POTS is not easy. It is a constant battle in the sense that every day can contain new and unforeseen problems, and that no day – in my life at least – is POTS free. But, on the other hand, if you find something that you like to do, this might help you to keep fighting. Maybe working is not for you, but then try to find something else to motivate you, if not for anything but just to get you out of bed in the morning. There was finally a ray of hope today, after months of feeling awful and fighting hard to keep my job and stay sane. Over the previous years of dealing with my POTS condition, I have tried all kinds of medicine, but the result have always been either no effect or too critical side effects. A few months back I tried Midodrine, but just 5 mg made me ill a la an allergic reaction, so I quickly stopped that and feel back into hopelessness. Then someone in a POTS community told me, that some patients had better results with starting out really slow with Midodrine. At first I did not really feel compelled to try out something that had made me feel so bad, but you know desperate times … So yesterday I tried just taking 1/2 pill in the morning, that is 2.5 mg. I became high as a kite. Could not focus, was itchy and dizzy. Not as bad as when I tried taking a whole pill, but still bad enough to ruin my entire morning. After the effect wore off I became tired and slept the whole afternoon. So another day disappeared from my life in a haze of nothingness. But to be fair some of the effects had seemed promising. My pulse, which is almost always very high and varying, had become low and constant … It had just become way way too low (around 50BPM while standing up). So this morning I pulled myself together for a final test of the drug. I tried taking just 1/4 of a pill, that is about 1.25 mg, in the morning and then again 4 hours later at lunch It seemed a ridiculously small amount and it was rather hard to split the pill into so small parts, but to my great surprise it worked wonders. I felt great. The only significant side effects were constant goosebumps and the occasional visual problem with focusing. My pulse is still quite low (which I have to get used to since I’m normally hyper like the Duracell bunny), but it’s in the normal range. For the first time in months I was able to work an entire day without becoming sick! 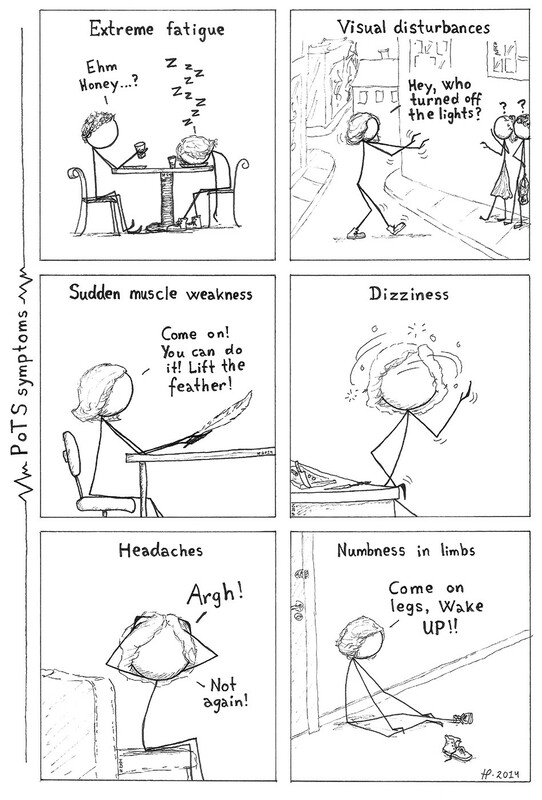 The big problem is normally lunch, because each time I eat, I have a POTS attack of some sort with multiple symptoms. But today there was not even one symptom! To be honest, it was weird, because I have lived so long with being off that feeling right is alien. I know I should not become too hopeful at this point, but my oh my, it just felt so great. So I want to celebrate. Even if this were a one-off thing, that would never happen again, I want to celebrate. The good days are so rare that they must be appreciated! I hope that this is the promise of something good, but even if it isn’t I just want to send my thanks out there for having one great day where I actually could feel almost normal.